What is an FX creation without color? Boring, bland, and wholly unconvincing. As detailed as your prosthetics and masks may be, the depth and blend of color is what will ultimately bring your creations to life. For better effects, start with better makeup options. 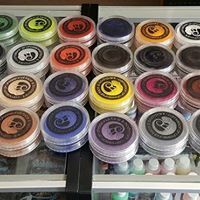 Whether you’re looking for bold waterproof body paint, rich water soluble options, or pro-level airbrush paints, we have the selection to make your creations come to life. Mix and match colors from our Chameleon professional face and body paint selection; just add water to a brush or sponge and get painting. 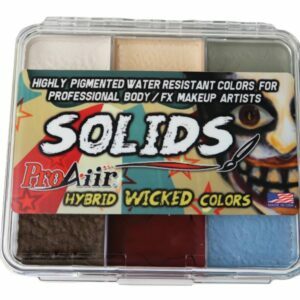 Or, if you’re looking for pro-level airbrush colors, we carry a full line of Pro Aiir colors. 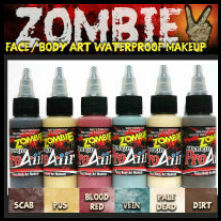 Pro Aiir is a great versatile option because this waterproof body paint can be used with an airbrush machine or sponged/brushed on, to give your makeup jobs the depth and detail you need. We also have specialty color kits to get you started. Choose between options like UV fluorescents, skin tones, primary colors, or even zombie palettes. Got questions about our waterproof body paint options? The Chaotic Creations team is happy to help guide you in the right direction. Drop us a line or give us a call today!